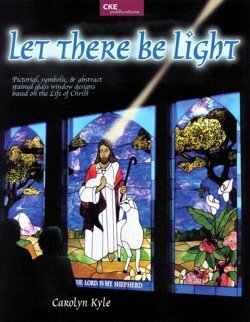 Over 50 pictorial, symbolic, and abstract stained glass window designs based on well-loved, time-honored scenes of the Life of Christ. Color images and black and white cartoons of each window are provided. Instructions for changing sizes, proportions, and complexity of designs are also included, as well as instructions and examples for incorporating stained glass medallions. This is a very well conceived and executed book and would be a first choice for anyone interested in doing any kind of window on a religious theme. This well thought out book has eighty religious window designs. Designs range from realistic to abstract. Text is included with references to the meaning of color and religious symbolism. 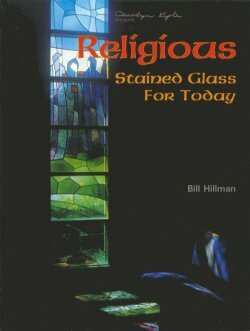 A good source book for people getting involved in making windows for their church. Many color illustrations and Bill Hillman does a nice job of getting you familiar with the styles you'll encounter. 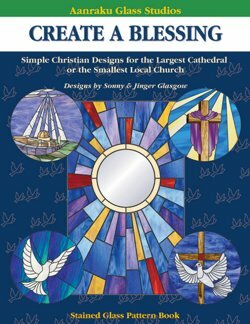 This pattern book features simple Christian designs for the largest cathedral, or your smallest local congregation. Check the patterns on the front cover, at left. The patterns consist of round medallions (the four corners) that can stand alone or can be inserted into a background (the large rectangle in the center). The book features 15 medallion centers plus 12 background patterns. All are illustrated in full color.